A couple weeks ago, I had the pleasure of meeting Brandy in my shopping tote class. We got to talking and she told me about a spiced pear jam that she often gave away as a gift for the holidays. I’d never had pear jam before, but was instantly intrigued. Especially because I remembered that my parents had two pears trees in their backyard that were laden with more pears than they knew what to do with. This was my first attempt at making jam, but I was armed with a couple different recipes from Brandy and a huge bag of Bartlett pears from my parents. My mom came over on ‘jam day’ and helped with all the peeling, coring and chopping of the pears. We made two batches and ended up with seven jars of seriously delicious jam. I sense a yearly jam tradition starting up. To sterilize your jars and lids, fill a very large pot half full with boiling water. Add the empty jars and lids and bring to a boil, reduce the heat to low. Keep the jars in the hot water. Peel, quarter and core the pears. Chop them in small cubes and toss them in a bowl with the lemon zest and lemon juice. Set aside. In a large heavy saucepan combine the apple juice concentrate with the vanilla bean and the water. Boil it over moderate heat for 10 minutes. Remove the vanilla bean and add the pears and their liquid. Bring the mixture to a boil over moderate heat and cook, stirring frequently, about 45 minutes, or until the mixture thickens enough to hold its shape on a spoon and has reached nearly 220 degrees on a candy thermometer. Using tongs, carefully remove the jars and lids from the hot water and drain them. Fill the jars with the hot jam, leaving 1/4 inch headspace at the top of the jar. Wipe the rims of the jar clean with a dampened cloth and fit the lids on the tops of the jars. Screw on the bands very firmly. Lower the jars into the water and add more hot water so that the water is one to two inches above the jars. Bring to a boil. Cover and boil gently for 10 minutes. Remove the jars to a rack and cool completely. Do not invert. This recipe contains no added sugar or pectin, something you’ll find in traditional jam recipes. It uses the natural fruit sugars to give a more natural sweetness. The end result is not as gelled or sweet as regular jam, but this leaves you with something that resembles a thick pear sauce. You won’t believe how flavourful this recipe is, especially with the vanilla bean. I had some of the jam over french toast the other day and it was incredible! the recipe doesn’t seem daunting at all and i’d like to try it! where can you buy vanilla bean? is it something that they would sell at loblaws? melissa, it’s crazy delicious. i usually buy vanilla beans at my health food store or william sonoma. i’m sure any high end grocery store carries them now. 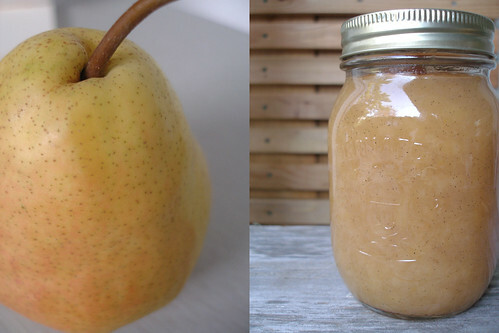 wow I would never have though to make pear jam but it sounds delicous. I am putting together hampers for my family for Christmas and might just add this too it! Bev – i actually made two different recipes. the recipe above gave me four jars, which sounds like it will be perfect for what you’d like to do. Yishy – I filled four 500ml jars with this recipe. I really let it reduce for a while, probably longer than the recommended 45 minutes, so if you cook it for a shorter time you’ll have more jam! i had some this morning on french toast – yum. I made this jam yesterday but I had to substitute white grape froz. concentrate because I couldn’t find any apple concentrate! I also think I had a bit of an overkill on the lemon so my jam is pretty tart but still delicious. The grape conc. does kill some of the warmth I associated with the jam. Can you tell me where you purchased your apple conc.? yishey – i just got my frozen apple juice concentrate at my local grocery store – no frills. you should be able to find it quite easily. how many jars did your batch turn out? Really? I went to Dominion and they had nada in the froz. apple concentrate. My batch turned out 8 x 250 ml jars. Yishey – how weird, i thought frozen apple juice was a staple, at least it was when i was a kid. i can’t imagine how many frozen cans of juice we used to go through. i would LOVE to have your spiced peach jam recipe. next year, i really want to do much more canning and making jams as local produce is in season. That sounds wonderful…no sugar and no pectin. My kids would adore this, we just went pear and apple picking and I am dealing with pounds and pounds! Fabulous. I once had a French Pear-Vanilla Jam from Williams-Sonoma that I thought was the best thing in the world. The weird thing is that I paid $9 for something I could easily make at home. I’ll definitely be trying this out. Thank you so much. I have a pear pineapple jam I make, but I love that this one is low sugar I will definitely try it this year. I am going to make gift baskets for everyone in my family next year for Christmas and this will be one of the things I put in it. Thanks! Your jam recipe sounds delicious. Thank you for sharing it. I have the morning free and I’ve been spending it with a cup of tea, a little sewing, and looking through your blog archives. I’m so happy to have found your blog. Your work is so lovely. I really can’t tell you how much I’d love to take your class on Japanese dress books. Or, any class, really. lovely work. lovely blog. lovely you. This looks fantastic! How long did it keep? Do you think it will also work with vanilla extract and apple juice? And if so how much? thanks for this wonderful sounding recipe! Your recipe sounds delicious. I just made pear jam for the first time yesterday. My recipe is similar to yours, but with two vanilla beans (available at The Bulk Barn, btw) and sugar instead of apple juice. I find it a bit too sweet, so I’ll try this alternative, next time. Thx for writing about it. How ripe do the pears need to be? If they are hard pears can you still use them? hi kurt. if they pears aren’t ripe, it’s best to wait until they soften up. you’ll get the best results with fruit that is ripe! Thank you so much for this recipe. I made it today with 23 lbs of pairs and it yielded 18 8oz jars. I cooked it for 2.5 hours… But burnt a tiny bit on the bottom of the pots. The jam came out marvelous with no added sugar and no pectin. I used Meyer lemons for an added frangrance, and just realized I forgot the zest. Well it worked out and I’m so glad I found your recipe. Thank you for all your advice. My first time making jam and I feel like a real adult. Lol.